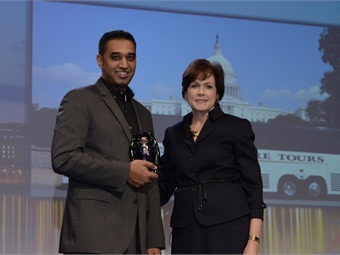 MCI VP, new coach sales, Patricia Ziska, right, presents the ABA Green Spirit Award to Adventure Tours President Adnan Khan. Orlando, Fla.’s Mears Transportation and Clinton, Md.’s Adventure Tours were honored with the American Bus Association’s (ABA) Green Spirit Award in Louisville, Ky. More than 800 industry sponsors attended the awards ceremony at ABA Marketplace (Jan. 8-12). The ABA Green Spirit Award, which MCI began sponsoring in 2011, goes to operators who demonstrate best practices in environmentally friendly operating and business policies. Nominations are reviewed in cooperation with the Certification for Sustainable Transportation at the University of Vermont and submitted to the ABA environmental committee for judging. Mears of Orlando and a long-time leader in the ground transportation and group tour industry, won for its comprehensive business sustainability policies. The operator moves nearly eight million passengers a year through its 220-coach fleet. Adventure Tours won for its eco-friendly driver training and recognition efforts. In the smaller operator category, Adventure took home the award for training its driver team to use “Idle Free” and “eco-driving ” techniques, recognizing each driver’s achievements on a “wall of fame” with framed “eco” and “idle” certificates. Adventure, serving the greater Washington, D.C. area, also promoted the greenness of motorcoach travel at the Department of Transportation’s Earth Day Fair in 2014. The company has grown its fleet to 11 coaches, mostly model year 2012 or newer. MCI established the award with the ABA to promote advances in clean-diesel engine technology. The award also recognizes ABA industry operators for their green-friendly equipment investments and business practices and their dedication to offering the riding public sustainable transportation options. The motorcoach surpasses the train, plane and passenger car in lower emissions per passenger mile by far. Today’s most eco-friendly motor coach options feature clean-diesel engines with advance technology that lowers emissions, making them cleaner and more fuel efficient than ever.